"Seven years after their previous recording, Persian percussionists Trio Chemirani return, nourished by their own rich musical experimentation and by meetings with musicians from around the globe. 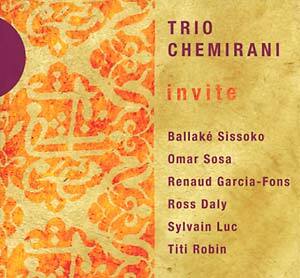 For their new album Invite, based upon a concert series of the same name, Trio Chemirani have put together a spectacular list of invitees, including kora master Ballake Sissoko, jazz pianist Omar Sosa and Titi Robin on bouzouki. The musical interplay between these great artists is nothing short of revelatory."